To Cite: Haydari A, Sabzi F, Dabiri S, Poormotaabed A. Right Para Cardiac Pericardial Cyst, Multidiscip Cardio Annal. 2018 ; 9(2):e68382. doi: 10.5812/mcardia.68382. The reported annals incidence of pericardial cysts (PC) in medical literature varies from 1/100000 to 1/120000. They are usually incidentally found during a thoracic or cardiac surgery or by an imaging modality by chance or remain clinically asymptomatic until the 3rd or 4th decades of life. However, in rare cases, compression or rupture of cysts into the surrounding structures, lead to the appearance of symptoms that may further be diagnosed by imaging modalities. We report the case of a 35-year-old man, with presentation of palpitation and chest pain and dyspnea. A transthoracic echocardiography (TTE) and computed tomography (CT scan) confirmed the presence of a cystic lesion the in right lower cardiac border. 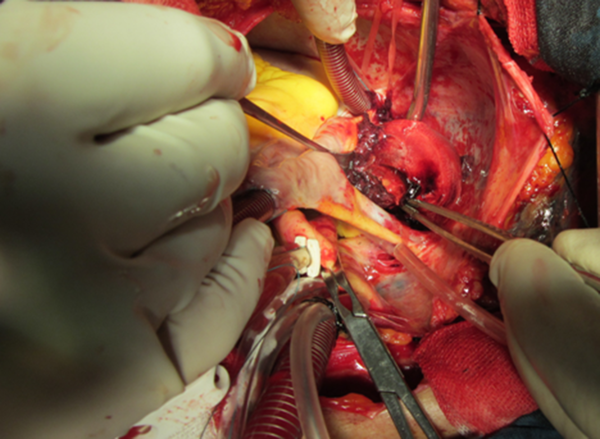 With the impression of a hydatid cyst, he has undergone open cardiac surgery and during mediastinal exploration a well-defined cyst filled with pasty and thrombotic materials was found intrapericardialy that was attached to the right atrial wall. The cyst with the inflammatory thick wall was enblockly resected. In the histological examination, diagnosis of pericardial cyst was confirmed. The postoperative phase was uneventful and during 6 months of follow-up he was good with no pericardial effusion on TEE. Copyright © 2017, Multidisciplinary Cardiovascular Annals. This is an open-access article distributed under the terms of the Creative Commons Attribution-NonCommercial 4.0 International License (http://creativecommons.org/licenses/by-nc/4.0/) which permits copy and redistribute the material just in noncommercial usages, provided the original work is properly cited. PC is a rare congenital disorder, comprising approximately 7% of all mediastinal mass. The incidence of this lesion in the sole pericardial mass is estimated to be higher between 10% - 17%. These cystic masses are known as the most common benign neoplasm of the pericardium and may have an embryologic base for their occurrences (1). They are often detected in the third to fifth decade of life, but small cysts may be found even in the 8th decade of life and their chance of incidence is equal between both genders. Clinical signs and symptoms of these cystic masses are similar to other neoplasm of the pericardium such as hydatid cyst, loculated pericardial effusion, thymoma, thymolipoma, lipoma and rare malignant tumours (2). A 35-year-old man, admitted to our emergency center with the complaint of palpitation, dyspnea and non-productive cough for the recent three weeks. His past medical history except for temporary paroxysmal palpitation was unremarkable. In a recent presentation his ECG showed irregular rhythm. 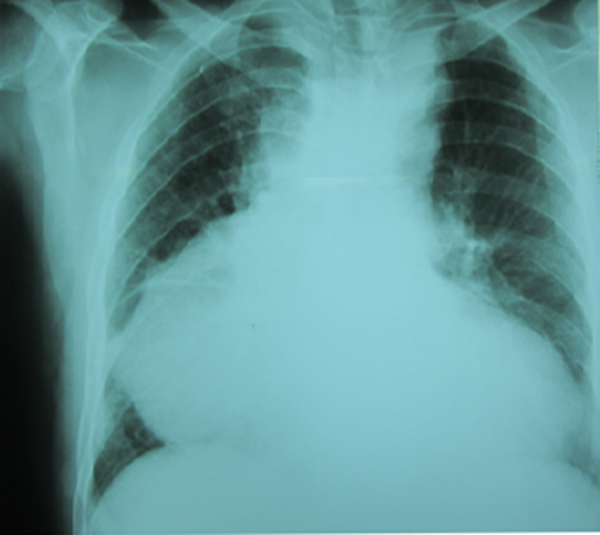 Chest X-ray revealed a dumping in the lower right cardiac border (Figure 1). Routine laboratory examinations including complete blood count, BUN, creatinine, NA and K were unremarkable but hepatic function tests were abnormally high. Sedimentation rate and C-reactive protein were in abnormal high ranges. Arterial blood saturation in room air was normal. On physical exam, he was not tachypneic or tachycardic and had normal blood pressure (100/70 mm gH). Respiratory and cardiac sound was normal. No evidence of tamponade was found on examination. TTE showed a large cystic mass with a well-defined border and with a homogenous echo density lying on the right atrial border above the right diaphragm. The PC was closely attached to the surrounding cardiac structures, most probably representing a hydatid cyst (Figure 1). CT scan was added to imaging modality that showed a large para cardiac cystic mass closely related to cardiac structures (Figure 2). The patient was scheduled for an open surgery that was performed by midline sternotomy by beating off-pump resection. In intra-operative inspection, he was known to have an intra pericardial cystic mass compressing the right atrium and inferior border of the right hemi diaphragm. There was mild serosanguineous pericardial effusion (Figure 3). The cystic mass had a thick wall with severe inflammatory reaction. Its cavity contained necrotic and fibrins and thrombotic materials with some pasty like materials without the presence of the daughter cyst or typical germinal layer as seen in the HC (Figure 4). The medial wall of cystic mass was attached densely to the right atrium and compressed its cavity. Therefore in order for prevention of cardiac injury, left open for pericardial cavity, but other parts as lateral borders adhered to partial pericardium were easily released and excised. It seems that the erosion of cyst wall to thin atrial wall caused a silent bleeding to cyst cavity and subsequent thrombus formation. No connecting vascular pedicle from cyst to aorta or great vessels was found. 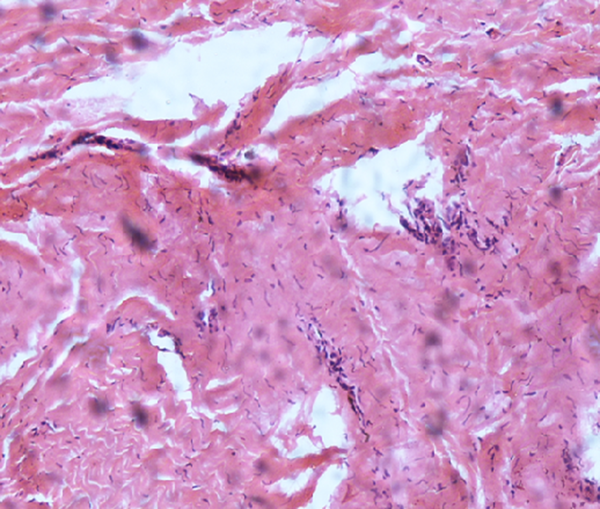 On histopathological exam some evidence of necrotic, fibrinous and thrombotic material with an inflamed pericardial layer were found and no malignant tissue or cells were detected (Figure 5). The postoperative course was uneventful and he was discharged in the 6th day of operation and in the 6th months of follow-up no recurrence of effusion was detected by TEE as his clinical condition was good. Commonly, pericardial cysts are detected in routine examinations as an incidental finding. It is commonly diagnosed because of unusual findings on routine chest examination. Chest X-ray reveals a bulged contour of the right heart border. Other diagnostic ways for diagnosis of pericardial cysts include transthoracic echocardiography (TTE), computed tomography (CT), and magnetic resonance imaging of the chest. The most common clinical complaints are atypical chest pain, respiratory distress, cough, and palpitations. Sometimes, these masses may change the cardiac hemodynamic or lung inflation and cause signs and symptoms that is similar to symptomatic tricuspid valve stenosis, pulmonary valve stenosis or constrictive pericarditis (3). In our case report, symptoms of right heart failure were found due to compression of the right atrium and right ventricle, as detected by echocardiography. Transthoracic echocardiography as an imaging method is usually appropriate to establish the diagnosis of cyst, and sometimes is the necessary method to complement with other modalities such as transesophageal exam in some cases of the cysts that have atypical location. Pericardial cysts occur as a result of an aberrant embryologic process in which from mesenchymal diverticula that form the future pericardial sac, a bud like outgrowth protrudes to the lateral side, separates from main diverticula and formes a pericardial cyst. Others believe that failure of fusion of the two bud leads to the formation of an accessory PC (4). Nearly 80% of PC similar to our case are asymptomatic and are usually detected incidentally during a routine evaluation for another pathology. Seventy percent of PC is detected at the right border of heart toward the costophrenic angle, and 20% is located on the left cardiac border and the remaining ten percent of the cysts are found in the posterior or anterior mediastinum (5). It needs to be verified if the size or location of the PC correlates with higher rates of sequels. However most PCs are asymptomatic but compressive effects of the cyst on the surrounding structures such as diaphragm , cardiac and lung may lead to dyspnea, hiccups, arrhythmia, chest pain, and in some cases sinus tachycardia, protracted cough and episodes of pneumonia and bronchitis and respiratory tract infection have been reported (6). Other complications include inflammation of the cyst wall, infection of the cyst content and rupture of the cyst into surrounding structures resulting from partial erosion of necrotic cyst wall. Ruptures commonly occur into plural cavity however in rare cases of pericardial erosion or rupture into pulmonary tissue or main bronchus has been reported and two cases of supra valvar pulmonary stenosis, and compression of right ventricular outflow tract by cyst, have been observed in two separated studies (7). The spontaneous resolution of a cyst is a rare event and, most likely results from erosion of cyst wall and subsequent drainage of cyst contents into the pleural space. The spontaneous resolution of cyst occurs only in non-inflamed and non-infected cases. CT scan with contrast is the imaging modality of choice for proper diagnosis of PC. However, no studies have confirmed the superiority of one imaging modality to the others such as MRI or echocardiography. On contrast CT scan, in the infected PC cases, or with inflammation of the PC wall, it appears as thick-walled with sharp border and homogeneous content. Failure of enhancement is due to intactness of wall in relation to cardiac chambers (4, 8, 9). The three modalities of PC treatment include, follow-up with symptomatic management, non-surgical intervention by percutaneous cyst content drainage, and enblockly resection of the mass. The indications of surgery include huge size, protracted symptoms, unknown nature and behaviour of the cyst and prevention of serious complications such as rupture into pericardial cavity tamponade, suffocation by obstruction of respiratory tract and respiratory failure (10-14). The PCs are rarely the cause of dyspnea and these symptoms might be a reason for patient’s referral to heart centres for further evaluation. Simple lain chest X-ray highlights the presence of a PC that may be verified by further imaging especially with CT scan. Definitive treatment for symptomatic PC is surgical removal. Authors’ Contribution: All authors contribute to the preparation, writing and editing of the manuscript. Consent: “Written informed consent was obtained from the patients for publication of this case report and accompanying images. A copy of the written consent is available for review by the Editor-in-Chief of this journal”. 1. Patel J, Park C, Michaels J, Rosen S, Kort S. Pericardial cyst: case reports and a literature review. Echocardiography. 2004;21(3):269-72. doi: 10.1111/j.0742-2822.2004.03097.x. [PubMed: 15053790]. 2. Celik T, Firtina S, Bugan B, Sahin MA, Ors F, Iyisoy A. A giant pericardial cyst in an unusual localization. Cardiol J. 2012;19(3):317-9. doi: 10.5603/CJ.2012.0056. [PubMed: 22641553]. 3. Satur CM, Hsin MK, Dussek JE. Giant pericardial cysts. Ann Thorac Surg. 1996;61(1):208-10. doi: 10.1016/0003-4975(95)00720-2. [PubMed: 8561555]. 4. McMillan A, Souza CA, Veinot JP, Turek M, Hendry P, Alvarez GG. A large pericardial cyst complicated by a pericarditis in a young man with a mediastinal mass. Ann Thorac Surg. 2009;88(2):e11-3. doi: 10.1016/j.athoracsur.2009.05.024. [PubMed: 19632370]. 5. Ilhan E, Altin F, Ugur O, Ozkara S, Kayacioglu I, Aydemir NA, et al. An unusual presentation of pericardial cyst: recurrent syncope in a young patient. Cardiol J. 2012;19(2):188-91. doi: 10.5603/CJ.2012.0032. [PubMed: 22461053]. 6. Bava GL, Magliani L, Bertoli D, Gorrieri PF, Rimini A, Zaccagnini G, et al. Complicated pericardial cyst: atypical anatomy and clinical course. Clin Cardiol. 1998;21(11):862-4. doi: 10.1002/clc.4960211118. [PubMed: 9825205]. 7. Ozturk E, Aparci M, Haholu A, Sonmez G, Mutlu H, Basekim CC, et al. Giant, dumbbell-shaped pericardial cyst. Tex Heart Inst J. 2007;34(3):386-7. [PubMed: 17948096]. 8. Najib MQ, Chaliki HP, Raizada A, Ganji JL, Panse PM, Click RL. 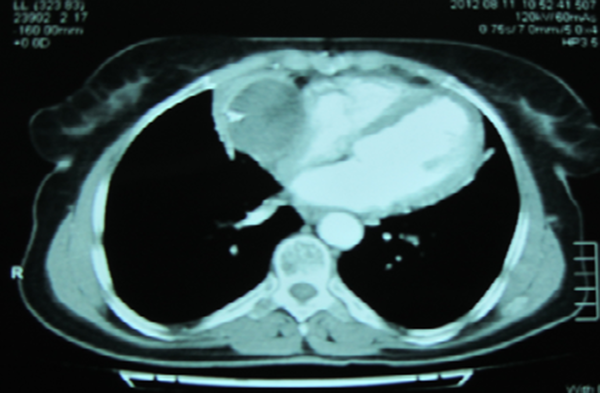 Symptomatic pericardial cyst: a case series. Eur J Echocardiogr. 2011;12(11). E43. doi: 10.1093/ejechocard/jer160. [PubMed: 21900299]. 9. Borges AC, Gellert K, Dietel M, Baumann G, Witt C. Acute right-sided heart failure due to hemorrhage into a pericardial cyst. Ann Thorac Surg. 1997;63(3):845-7. doi: 10.1016/S0003-4975(96)01373-2. [PubMed: 9066418]. 10. 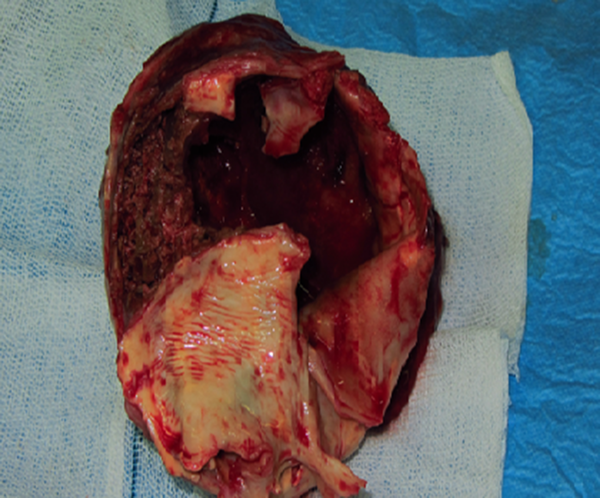 Noyes BE, Weber T, Vogler C. Pericardial cysts in children: surgical or conservative approach? J Pediatr Surg. 2003;38(8):1263-5. doi: 10.1016/S0022-3468(03)00285-9. [PubMed: 12891510]. 11. Shiraishi I, Yamagishi M, Kawakita A, Yamamoto Y, Hamaoka K. Acute cardiac tamponade caused by massive hemorrhage from pericardial cyst. Circulation. 2000;101(19):E196-7. doi: 10.1161/01.CIR.101.19.e196. [PubMed: 10811604]. 12. Hoque M, Siripurapu S. Methicillin-resistant Staphylococcus aureus-infected pericardial cyst. Mayo Clin Proc. 2005;80(9):1116. doi: 10.4065/80.9.1116. [PubMed: 16178489]. 13. Nishigami K, Hirayama T, Kamio T. Pericardial cyst rupture mimicking acute aortic syndrome. Eur Heart J. 2008;29(14):1752. doi: 10.1093/eurheartj/ehn038. [PubMed: 18296680]. 14. Uchiyama A, Shimizu S, Murai H, Ohshima A, Konomi H, Ogura Y, et al. Infrasternal mediastinoscopic surgery for anterior mediastinal masses. Surg Endosc. 2004;18(5):843-6. doi: 10.1007/s00464-003-8191-0. [PubMed: 14755356].